Is there an easy way to create PDF from HTML and edit PDF description one time? 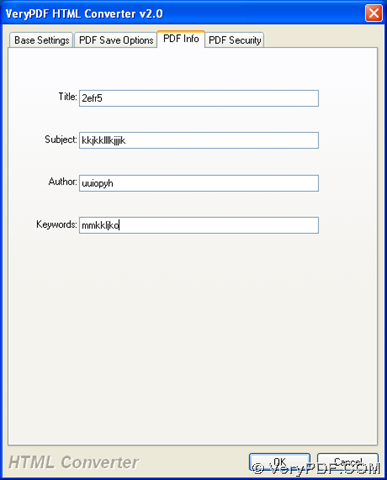 Of course, I think HTML Converter will solve all of your problems here, which is a professional tool to convert EMF, WMF, HTML to PDF, TIF, JP2 or other formats in Windows systems. Besides, this software supports editing PDF description, PDF passwords, margins etc.. For more knowledge about it, you can go to official website of HTML Converter. 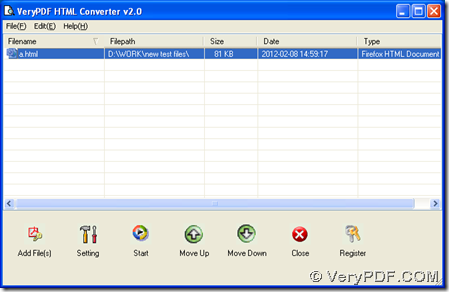 Please double click installer of HTML Converter, then follow setup wizard step by step till it is successful to install HTML Converter on your computer. 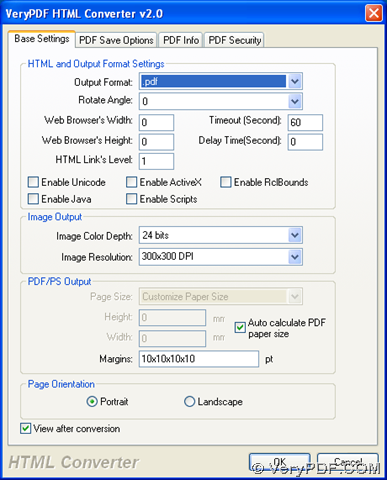 Then, you need to click button “setting” on GUI interface in order to set targeting file type as PDF and objective properties of PDF etc. 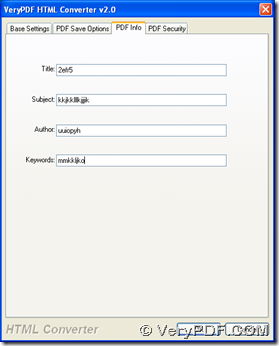 : click “setting” > select “Base Settings” > choose “.pdf” on dropdown list of “output format”, by now, your targeting format is PDF; then if you want to edit PDF description, please click tab “PDF Info” > type customized title, subject, author or keywords in their edit boxes accordingly, finally, to save your settings on this panel, please click “ok”. When you get GUI interface again, please click button of “Start” there, then select targeting folder in dialog box of “save as” in order to save your PDF file later, finally, to save this setting and produce PDF from HTML, please click “save” there. 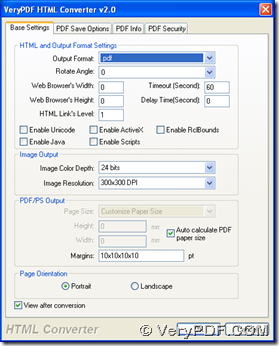 Then, in your targeting folder, there will be a new PDF generated from HTML file, and you can preview it on your computer flexibly. You can drop your messages here, if you feel confused or meet some problems in your process from HTML to PDF and editing PDF description with HTML Converter. Of course, if you think it is worth your purchase for HTML Converter, welcome to go to order page to get further information. This entry was posted in VeryPDF Blog and tagged HTML to PDF, PDF Description. Bookmark the permalink.